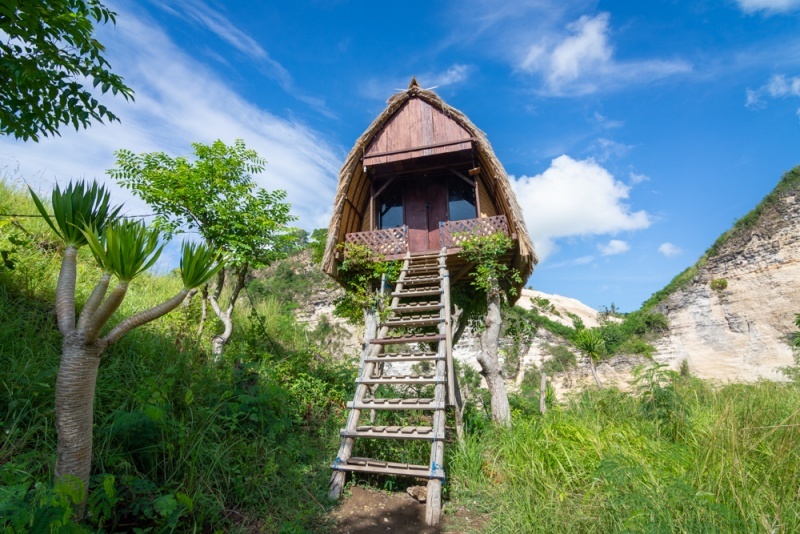 The Rumah Pohon “Tree House” is a unique place to stay when visiting Nusa Penida Island. 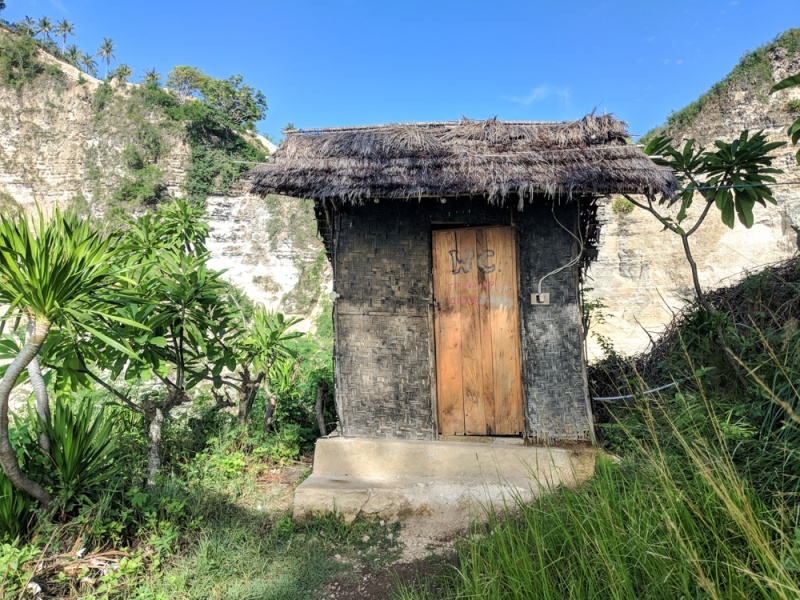 It originally gained notoriety as the Instagram treehouse of Nusa Penida and has become one of the most sought after accommodation options on the island. But staying in this famous treehouse requires some planning and preparation as there are only 3 tree houses and they get booked months in advance. 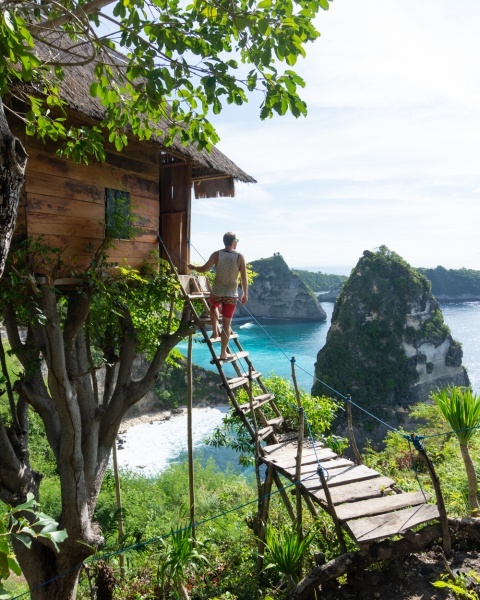 Read on to learn all about what you need to know in order to stay a night in an actual treehouse on Nusa Penida and get your perfect Instagram shot! 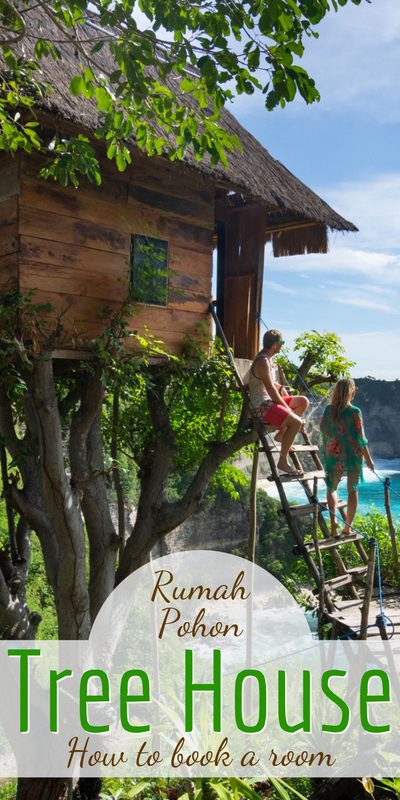 The Rumah Pohon Tree House is located high on a cliff on the southeastern end of Nusa Penida Island, near Diamond and Atuh Beaches. This mountain that juts out into the water is called Thousand Islands Viewpoints as you get spectacular views of the coastline in either direction, as well as Batupadasan and Batuabah islands. Rumah Pohon Tree House is essentially on the opposite side of Nusa Penida from the ferry pier. It’s under 20 miles but will take about an hour if you take the northern route. The southern route is where you’ll find most of the island highlights but the road is quite a bit worse so it’ll be slow going. Your best bet is to rent a moped from one of the many shops around town and drive yourself to the treehouse. That way you’ll have the freedom to explore the rest of the island on your own schedule and at your own pace. The Rumah Pohon Tree Houses are incredibly basic. You’re not paying for amenities here, you’re paying for the view from your own private, Instagram-worthy tree house balcony. Rooms are equipped with just a small, simple bed. There is a fan but no air conditioning. The rooms are quite small so don’t expect a desk or wardrobe, or any other conveniences that you generally get in a hotel. The shared bathroom is on the ground level. 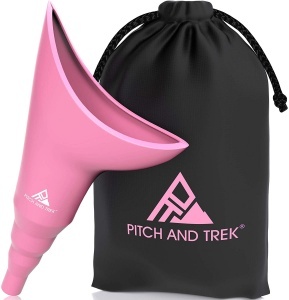 Again, they are basic but clean and you can get a hot shower. The easiest way to check availability and book your stay at the Rumah Pohon Tree Houses is through Booking.com. The cost is ~$40 USD per night. Be sure to request the tree house with the best view! Don’t be disappointed if you don’t get the treehouse you want, you’ll have an unforgettable experience regardless! Occasionally you can find a room available with fairly short notice, but normally the tree houses are booked up months in advance. It will be easier if you have some flexibility on the night that you want to stay in a tree house. Your best bet is to book your stay at Rumah Pohon Tree House at least 3 months in advance. You’ll probably find that one night at Rumah Pohon Tree Houses is plenty. You’ll want to be sure and watch both sunset and sunrise from your private balcony since you’re paying for those views. But because the rooms are so small and basic, you’ll be craving a comfortable bed and air conditioning after one night. 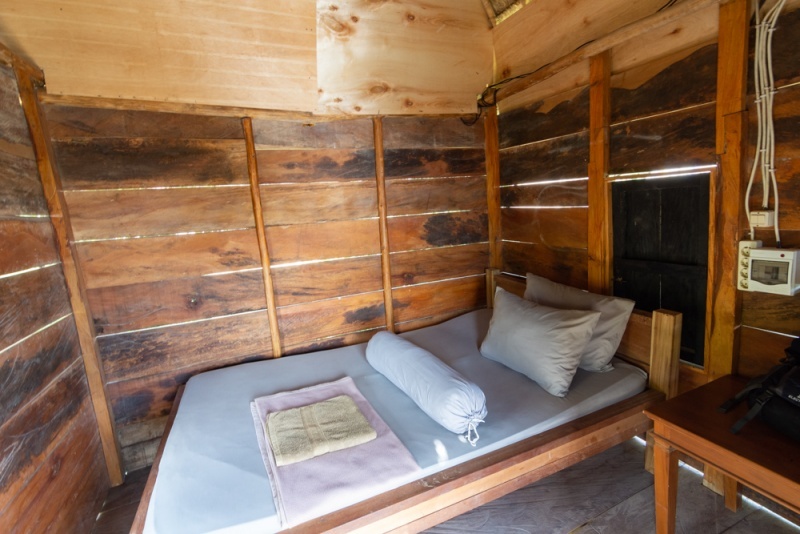 Before you book a room at the Rumah Pohon Tree Houses, there are a few things you’ll want to consider. First of all, every room is in a tree which means that you’ll need to climb a set of questionable stairs with nails sticking out of them every time you come and go. You’ll be better off if you only have a small bag with you as dragging luggage up and down is precarious. There are also small cracks between the boards in the floors and the walls so insects occasionally sneak through. And there may be power outages in the night which would cause your fan to turn off. There are a few downsides of staying at the Rumah Pohon Tree Houses. 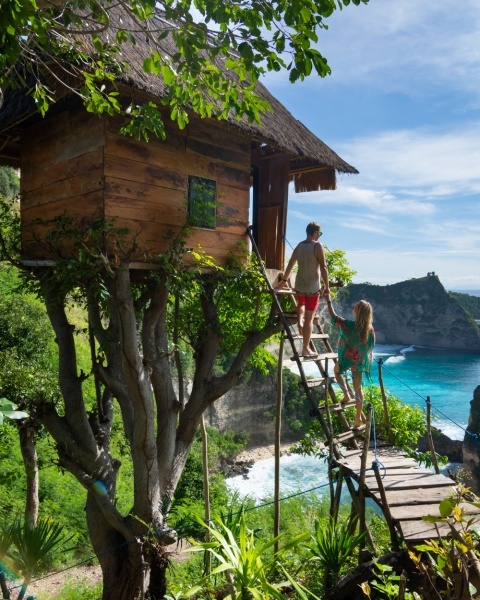 The first is that while there are technically 3 different tree houses that can be booked, only one is the iconic Nusa Penida tree house that you have seen on Instagram. And it is the most popular by far. So while you may be able to book a treehouse, it may not be the Instagram treehouse. The upside for not staying in the most famous treehouse in Nusa Penida is that you won’t have random people doing Instagram photoshoots on your stairs at sunrise. 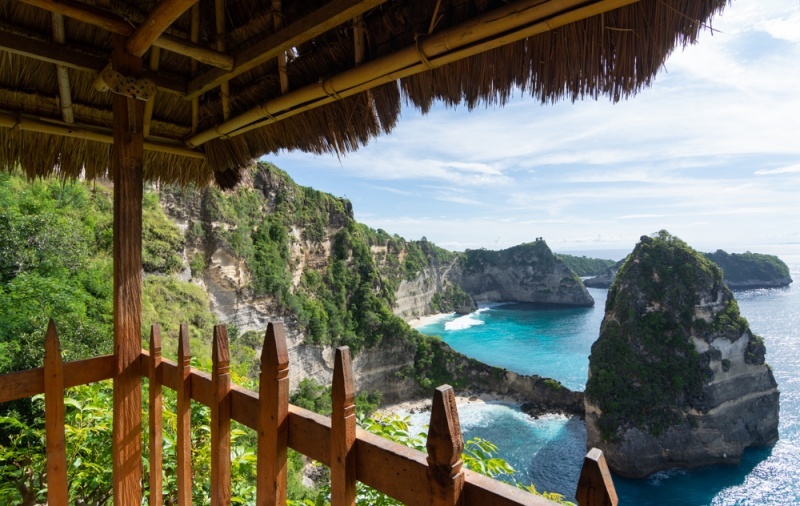 Because even if you don’t book a room here, you can still pay 10,000 IDR to enter the area and get your own Nusa Penida treehouse Instagram photo. And the owners do not limit where people are able to go. So even though you booked the room, you’ll probably have to share your sunrise view with people who have come to take Instagram photos here. They’ll be climbing up and down your stairs, snapping selfies. 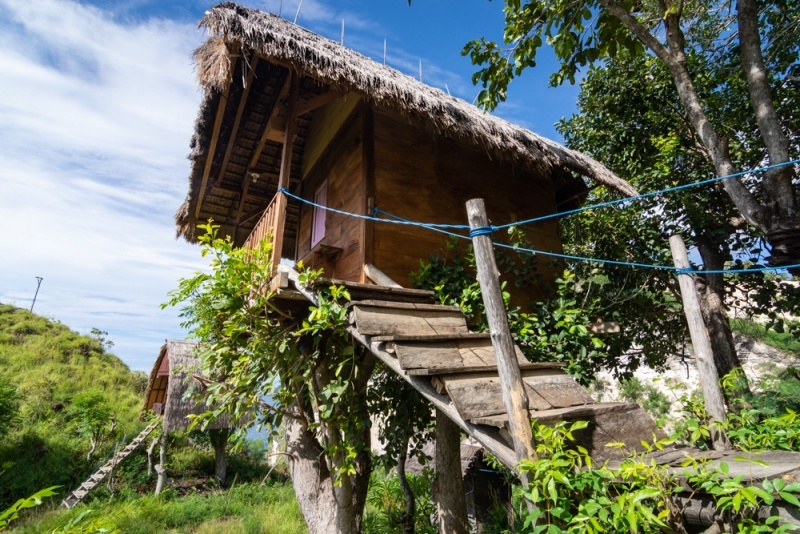 Considering that the accommodations at Rumah Pohon Tree Houses are super basic and that you’ll have random tourists doing photoshoots on your stairs at sunrise, we would actually advise that you stay elsewhere. There are several nicer hotels in the area where you can get a good night’s rest, a hot shower, and then just visit Rumah Pohon Tree Houses early in the morning if you want photos. Kempoel Jangkang is a hotel that is just a 5-minute motorbike ride from the treehouses. You’ll have your own private bathroom and the onsite restaurant serves outstanding food! Atuh Forest Cottage is a bit farther, it will take you 25 minutes by motorbike to get there. But you’ll appreciate the super friendly staff, the darling bungalows, and more amenities. The food here is outstanding so be sure to order dinner during your stay! Enjoy your stay at the Rumah Pohon Tree Houses! Need help in planning your trip to Indonesia? Check out our favorite travel guides!